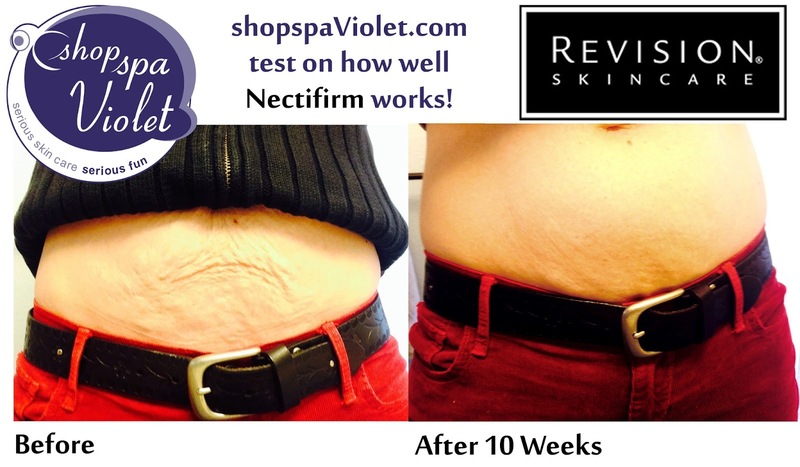 In mid-February I began to apply Nectifirm on my stomach, the "damaged "results of a 9.5 and 10 pound babies. They are 5 and 7 now and I want my bikini body back ! I bought the Pro Size Nectifirm from Revision to tackle this problem. Known for firming the neck, Nectifirm has been found to tighten the stomach as well as elbows and knees. I applied Nectifirm nightly very generously and lightly after a shower in the morning for ten weeks. I will admit, I wasn't as consistent as I should have been, making it 10 weeks, not 8 weeks. I now don't feel like I have to hide my mid-drift. My swimming suit won't need to be hidden anymore! Let's be honest, Nectifirm did not get rid of the middle age sag of the stomach when bending over. I feel Nectifirm did exactly what it is designed to do, to firm and tighten the skin.